Auckland. Also known as Dorkland, its inhabitants humorously refer to themselves as Jafas (Just Another F****** Aucklander). This city is one of the biggest tourist draws in New Zealand. It’s also where I spent the greatest percentage of my time during my visit, thanks to the Iceland volcano stranding me there. But, at the end of the day, it’s just like any other international city: shopping centres, marinas, a few theatres and museums. The Sky Tower was kinda cool, exploring North Head Fortress was fun, and a day at the zoo is always exciting (more on these at a later date), but I didn’t come to New Zealand to see cities. I came to New Zealand for adventure. So early one morning I boarded the big green Kiwi Express bus with a bunch of other people and escaped from Auckland. First off: a quick stop at the top of Mount Eden—or Maungawhau, to give it its proper Maori name—one of seventy dormant volcanoes in the area. 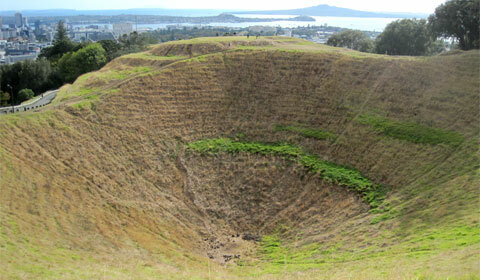 Mount Eden is the highest natural point in Auckland. 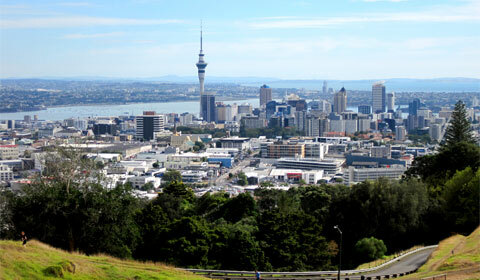 The 360-degree view of Auckland city you get from the top is pretty spectacular. You can even see Xena: Warrior Princess’s house from here. Soon we were on our way to the Coromandel Peninsula. Our driver, Matt, proved to be another true Kiwi character. His first instruction as we were leaving Auckland was that if the person we were sitting next to fell asleep, we were to stick a wet finger in their ear. His commentary, jokes and interesting taste in music made those two-and-a-half hours go by a lot quicker. We reached Mercury Bay early in the afternoon. On November 5, 1769, Captain James Cook anchored the HMS Endeavour here to allow him to observe the transit of the planet Mercury, and thus named the bay for it. 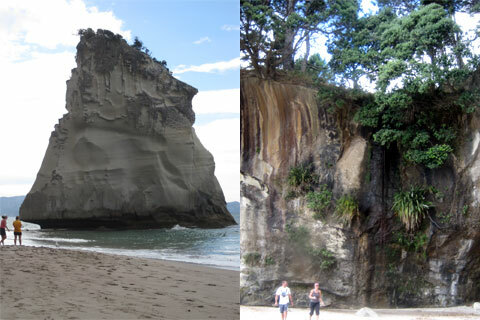 While everybody else on the bus grabbed their day packs and headed off for the half-hour trek down the coastal cliffs to Cathedral Cove, Matt decided to run it, proclaiming he needed to lose a few pounds after a summer of solid driving. Myself and a guy called Mike hopped into a mini-bus and were whisked away to Hahei. On the drive down to Hahei Beach, the weather turned threatening—overcast and a touch windy—but that wasn’t going to keep us from our adventure. Jumping out of the bus, we were greeted by the other four members of our group and our guide for the afternoon, before being introduced to our transport: tandem kayaks. Thank God I’d brought an OverBoard pouch for waterproofing my camera. We were eager to get out on the water so our briefing was kept suitably brief. Before I knew it I was hopping into the front of our little blue kayak, paddle in hand. That proved to be my first mistake. By letting Mike take the back seat I gave him control of the steering, making me the monkey and him the brains. But what we lacked in steering we made up for in power. I tell you, river kayaking will never be the same after getting out on the open ocean. Of course, the currents are stronger so you have less control over where you’re going, bobbing up and down with the surf, but that’s what makes it so much fun! And it’s great exercise. Once we got the hang of steering (or at least as much as Mike was ever going to manage), we went off to explore, paddling around Gemstone Cove and searching unsuccessfully for stingrays in Stingray Cove. The scenery is quite literally breathtaking. If you’re feeling adventurous or if you’re a good swimmer, all the areas we explored along the coastline are accessible by shore. But coming at it from the water is a whole different experience. The waters are crystal clear and the cliffs and rock formations are astounding. Because there are so few people around you genuinely feel as though you’ve discovered some untouched piece of paradise. 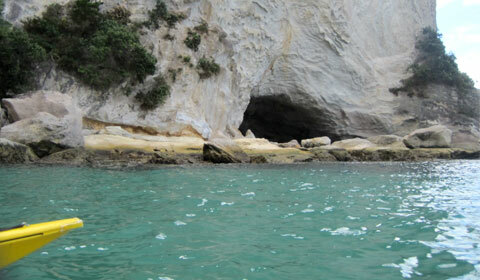 We headed a little further down the coast towards Cathedral Cove. 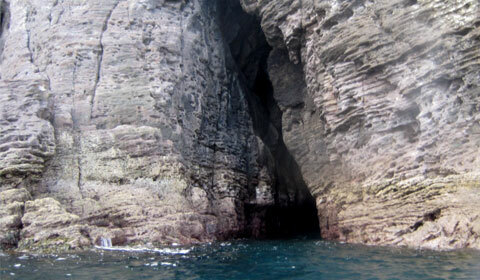 A little way out from the shore is a hole in the cliff wall, known as the Lover’s Cave, which can be swum to at low tide for a little privacy. Just make sure you don’t stay too long. Of course we had to go and have a nosy around. Riding the surf, we ran our kayaks up on the beach for a chance to stretch our legs. Most of our bus crew were to be found here but, despite there being more people around, it felt even more like a desert island paradise. 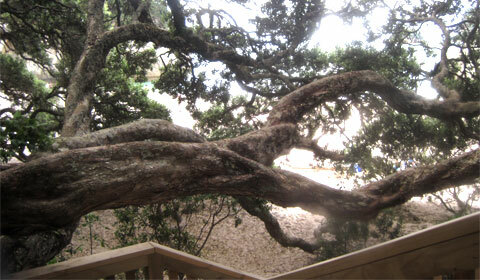 The trees that grow here are immense and droopy, creating plenty of shelters and hidey-holes. Hidden under one section is a nice, though very basic, wooden bathroom, with a pretty awesome view while you’re doing your business. 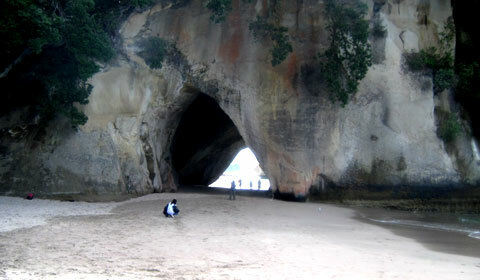 Cathedral Cove has become popular in recent years. Like much of the country, it has been used in more than one film. Imagine my surprise while watching The Chronicles of Narnia: Prince Caspian to see one scene go from a London Underground station to a rock archway that I’ve passed through myself. By the time I was done exploring, our guide had a nice little treat waiting for us: hot chocolate and cappuccino. 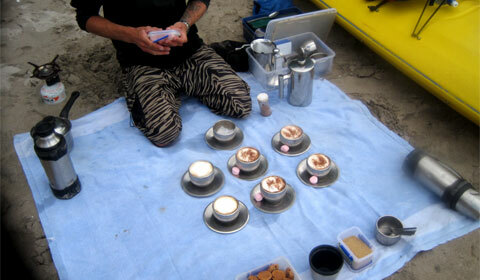 The guy had a mini cafe stashed away in his kayak and while we’d been messing around he’d been making us some much needed hot drinks. After the sugar boost we pushed back out to sea, heading away from the beach this time. 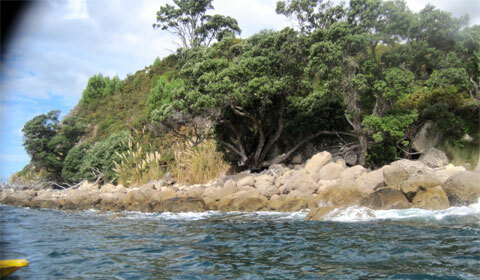 Nine miles out from the coast is a tiny island affectionately known as Pamela, or Mahurangi Island. This very large rock allowed a Maori chief called Hei—who had apparently arrived in New Zealand with the country’s legendary founder Kupe—to claim the area as his own . . . because the island looked like the curve of his nose. Apparently this meant that the area had been intended for him. The water was getting a bit choppy as we paddled up to Pamela but it was worth it. 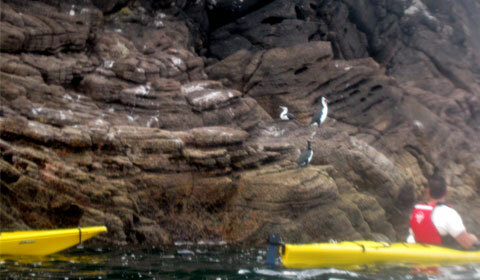 We got to meet a colony of blue penguins, and Mike and I got stuck in a crevice. What did I say about brains? The journey back to shore was great fun. Holding the kayaks together in a line and using a big Jolly Roger sail (that our guide miraculously produced from somewhere in his kayak) and hoisted up on a couple of paddles, we were able to grip-raft back to the shore, saving us a lot of effort. Our landing was far from graceful: coming into the beach too fast we all let go and Mike and I got a dunking as our kayak toppled over in the shallows. Absolutely pooped, Mike and I were put on a tiny ferry to make our way to Whitianga-o-Kupe —Kupe’s Crossing Point according to the translation, more often known as just Whitianga (pronounced fit-e-anga). A short walk later we arrived at the Turtle Cove Hostel in time to see our bags being carried off the big green bus for us by our bus mates. After that adventure, a spag bol dinner* and a soft bed were gratefully received. Kayaking is nothing to be afraid of, though I’d recommend starting on a lake or a river. It’s soooo much fun. And thank you, it’s so much fun to mutually inspire each other’s wish lists. You are funny, funny, funny! 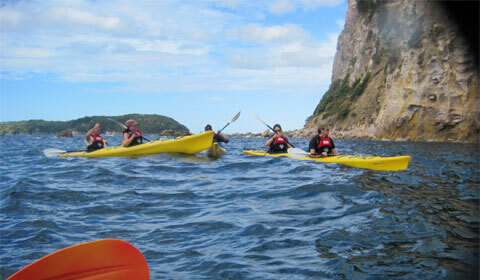 Not only did we get a great kayak tour of Mercury Bay – we got a GREAT read! Thanks! BTW – the commentary of the brains and power of the group? You had me giggling out loud at my desk and honey bunny thinks I’ve lost my marbles! What a wonderful adventure,and written so well! I love your photos. New Zealand has been on my bucket list since your last article. You make me want to go tomorrow! 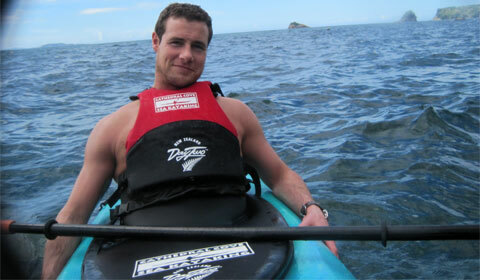 I’ve ocean kayaked in maui, and I can tell you its not half as easy as lake kayaking, which we do all the time here. I also got sea sick bobbing up and down with the surf. (forgot my Bonnine that day), but it didn’t last, and we had a ball snorkling with the turtles. Thanks for the great read! I’m looking forward to more!